Ron Howard just loves showing off shots from the Han Solo movie. There was Lando, Chewie and, uhh, Chewie again, but now we’ve got some fiery action. A flaming R2 unit to be precise. I bet he’s really bleeped off. If nothing else, it’s gotta hint at a cool action sequence, complete with some molten mayhem and things going up in Snoke – sorry, smoke. 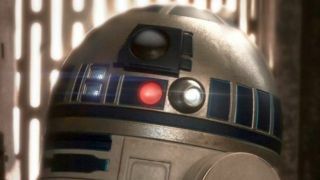 R2 units don’t just burst into flames… unless the Han Solo movie has a whole B-plot about defective models. Somehow, I doubt it. If you want more in the way of the upcoming Han Solo movie (and, honestly, who doesn’t?) then check out Donald Glover talking about the director switch and, to lighten the mood, a shot of Chewie’s wife. D’aww.